In July, Jason and I took the kids and flew to California to visit his family. Jason's brother, Daniel, was hoping to come home from Korea, but he couldn't make it. We got to spend time with Amanda and the boys, Emily, and Jay and Leslie. First of all, flying with 2 kids isn't fun. Brooklyn and Carson still require a lot of stuff, so we had a stroller, diaper bag, 2 car seats, plus our carryon bags. Brooklyn still wanted to nurse a lot and Carson didn't get a nap..... I'm sure you can imagine how stressful the trip there was. Once we got there, however, we had a ton of fun! The first day we were there we went to San Francisco. Amanda took us to Pier 39 and our first stop was the Aquarium at the Bay. It was awesome. 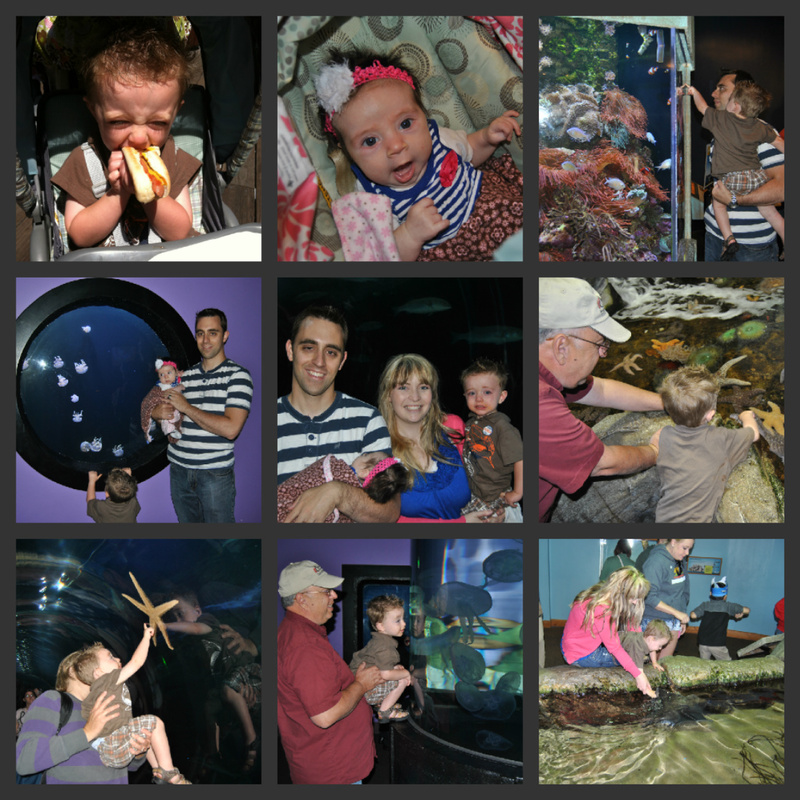 Carson loved the fish! He thought the jellyfish were really cool and when he found the clown fish he kept telling Jason, "Look, Dad! Nemo!!!" They had a pool with Stingrays in it and Carson and I got to touch one. 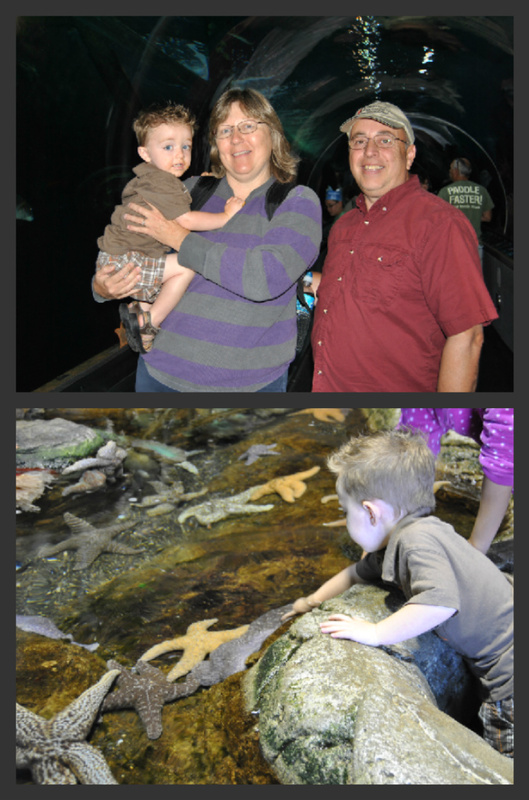 His favorite part was touching the starfish with Grandpa Jay. I didn't realize it, but starfish are actually hard. You expect to touch something a little soft, but nope - they are hard! 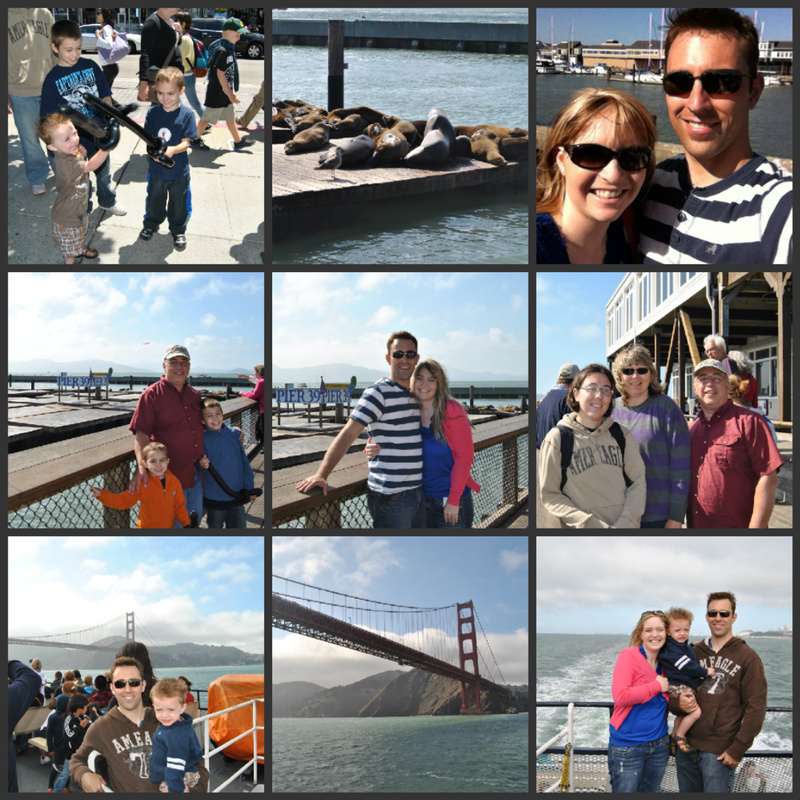 After the aquarium we walked around Pier 39, ate lunch at the Rainforest Cafe, and got to see the Sea Lions! I thought that was really cool. Carson and his cousins hit it off instantly! It's kinda sad that this was the first time they have ever met! An awesome street vendor made the boys balloon swords and told us that if one of them popped that day while we were there he would make us another one. With 3 boys I'm sure you can imagine how many balloon swords the poor guy ended up making. He was so fun about it and the boys loved him. After we saw the Sea Lions, Jason's parents took us on a boat ride that went around Alcatraz and under the Golden Gate Bridge. I think I was the most excited to see the Golden Gate Bridge. It reminds me of the days I watched Full House growing up. :) The boat ride was really windy and cold, but it was really fun. After our boat ride we went to Fisherman's Wharf and got some yummy fresh crab and shrimp. It was so good! By then the kids were tired and ready to go home, and so were the adults! 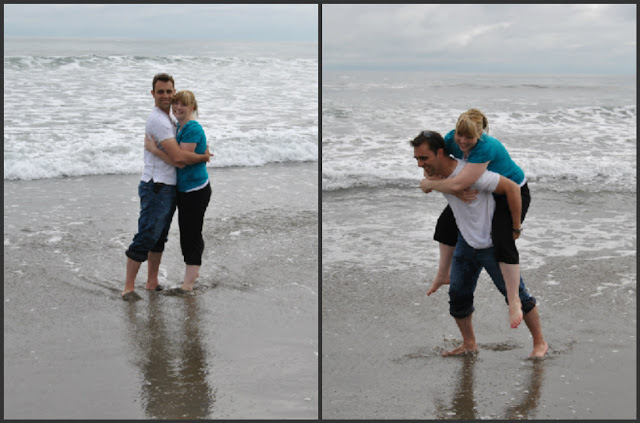 One of the things I was super excited about was going to a beach while we were in California. I didn't ever live close to one growing up and I hadn't ever spent time just going to the beach on any vacation I've ever been on. 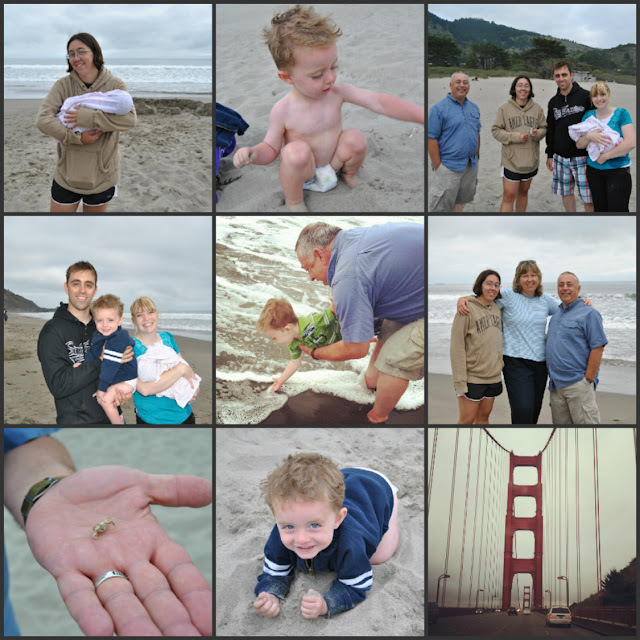 After a late start in the morning (spent sleeping in and shopping) we went to a beach just north of San Francisco. The drive to get to the beach takes you along Hwy 1, which was incredibly beautiful and incredibly curvy. I think all of us were about to get carsick! I have never been on a road with as many curves as that one before in my life! Carson started complaining of a hurting tummy so we had to stop and let him walk around for a bit. When we finally made it to the beach it was worth it. It was amazing. It was foggy and a little cold, and the water was FREEZING, but we had a great time! Even Carson loved the water! He would have us run up to the water as it came up to us and then we would try and beat it back to the sand. He kept calling the ocean the "motion". It was so much fun and we ended up getting a little bit more wet than we had planned. Jason decided to get all the way wet (he is insane, by the way) and walked way out in the water and then fell backwards into a wave. Carson thought that was the coolest thing ever and kept telling his daddy to go back and do it again. He was kinda bossy about it! haha! Jason, like any good daddy, did just what Carson said. He probably ended up doing it about 5 times before he told Carson he was done. 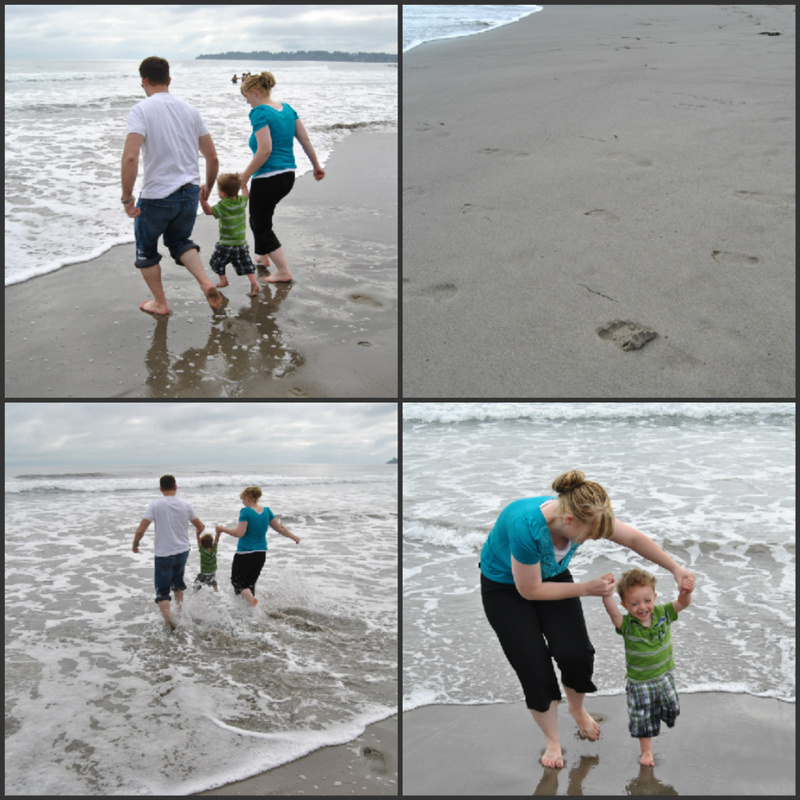 We had such a blast at the beach. I wish we could have spent another full day there having fun. Maybe next trip. :) Once we were done at the beach we drove across the Golden Gate Bridge *amazing* and went back to San Francisco and ate at Joe's Crab Shack. Yummy. The last day we were there we went to Six Flags. It was a lot of fun! 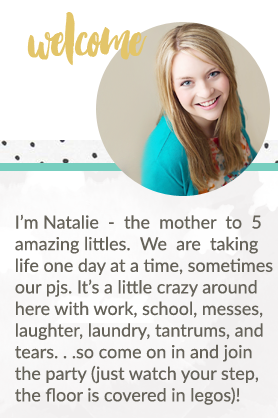 We felt like we didn't get to do everything we wanted to because there was so much! Carson got to ride a train with Grandma Leslie and Jason and he LOVED it!! He kept asking for the train over and over and over and over while we were there. Brooklyn and I hung out in the shade and she got to wear her cute little hat that was way too big for her! 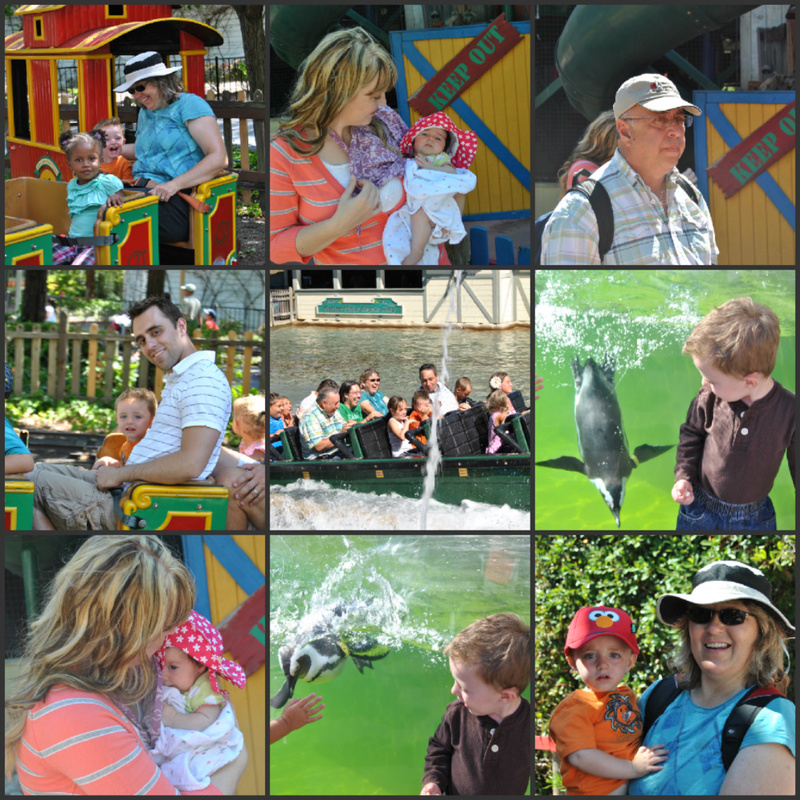 We all went on a few water rides and got soaked and Carson got to watch the penguins swim. He thought that was pretty cool. Afterwards we all went to Olive Garden to eat and I think about half of us fell asleep at the table. These two crashed after a week of being worn out!! The next day we headed out for the airport and flew home. We were all so tired and ready to get home. We spent the next 3 days recovering!! We had a blast and enjoyed spending time with the Messano side of the family. Thanks for updating your blog so I could see all of the pictures from your fun trip!! Makes me really miss you and those sweet grandkids of mine.....can't wait to see you guys again in a few days! It's going to be a blast! !